The orthopedic surgery in India is performed to derive the maximum bone and joint health under the top orthopedic surgeons in India. Our efficient line-up with the leading orthopedic doctors from across the country offer dedicated treatments during the different types of orthopedic surgeries. Tour2India4Health is #1 Medical Tourism company of India providing best Orthopedic surgery for over 10 years with 1000s of Satisfied Clients. All you have to do is send us your query, an assistant will contact you within 24 hours for interaction. The rest will be taken care of, so you only have to sit back and relax! Primary formalities - Arranging visas, accommodation, appointment with top Orthopedic Surgeon by Tour2India4Health Team. Professionalism - Utmost care taken in selecting best suitable surgery by best of the medical fraternity, ensuring fast recovery. Special packages - Find low cost Orthopedic surgery treatments in India that suit your budget so you don't have to put your health at stake. I came to India for orthopedic surgery of my fractured leg. Lack of medical facilities in my home country made me seek options abroad after which he came across Tour2India4Health Consultants. I contacted the team and they informed me about the procedure. I was asked to visit India for a surgery under an expert surgeon. I received the best treatment and the medical team helped me in my recovery. I am going back a happy, healthy man, thanks to the superb doctors and Tour2India4Health Consultants. The Greek word 'ortho' means straight and 'pedics' comes from the Greek word 'pais' meaning children. For many centuries, orthopedists have been involved in the treatment of crippled children. So over the years, the field has expanded to encompass many subspecialties and the treatment of a wide variety of musculoskeletal disorders in patients of all ages. Orthopedics is a specialty of immense breadth and variety. Orthopedists treat a wide variety of diseases and conditions, including such common injuries as fractures, torn ligaments, dislocations, sprains, tendon injuries, pulled muscles, and ruptured discs. Orthopedics is a medical specialty concerned with the diagnosis, care and treatment of patients with musculoskeletal disorders. The physicians who specialize in treating injuries and diseases of the musculoskeletal system are called orthopedic surgeons or orthopedists. The orthopedists may perform surgery to restore function lost as a result of injury or disease of bones, joints, muscles, tendons, ligaments, nerves, or skin; they are involved in all aspects of health care pertaining to the musculoskeletal system. Orthopedic surgeries are instrumental in correcting problems that arise in the skeleton and its attachments, the ligaments and tendons. It may also deal with some problems of the nervous system, such as those that arise from injury of the spine. These problems can occur at birth, through injury, or as the result of aging. They may be acute, as in injury, or chronic, as in many aging-related problems. What are the types of Orthopedic Surgery? What are the top Orthopedic Procedures? Knee replacement: Knee replacement is a procedure in which the surgeon removes damaged or diseased parts of the patient's knee joint and replaces them with new artificial parts. The operation itself is called knee arthroplasty. Knee arthroplasty has two primary purposes: pain relief and improved functioning of the knee joint. Because of the importance of the knee to a person's ability to stand upright, improved joint functioning includes greater stability in the knee. Hip replacement: Hip replacement is a procedure in which the surgeon removes damaged or diseased parts of the patient's hip joint and replaces them with new artificial parts. The operation itself is called hip arthroplasty. 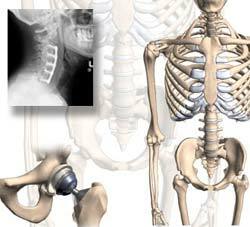 This type of surgery is done to replace or reconstruct a joint. The artificial joint itself is called prosthesis. Hip prosthesis may be made of metal, ceramic, plastic, or various combinations of these materials. Hip arthroplasty has two primary purposes: pain relief and improved functioning of the hip joint. Arthroplasty: Arthroplasty is surgery performed to relieve pain and restore range of motion by realigning or reconstructing a dysfunctional joint. The goal of arthroplasty is to restore the function of a stiffened synovial joint and relieve pain. As a surgical procedure, it is usually performed when medical treatment has not improved function in the affected joint. There are two types of arthroplasty surgery: joint resection and interposition reconstruction. Joint resection involves removing a portion of the bone from a stiffened joint, increasing the space between the bone and the socket to improve the range of motion. Scar tissue eventually fills the gap, narrowing joint space again. Pain is relieved and motion is restored, but the joint is less stable. Shoulder joint replacement: Shoulder joint replacement surgery is performed to replace a shoulder joint with artificial components (prosthesis) when the joint is severely damaged by such degenerative joint diseases as arthritis, or in complex cases of upper arm bone fracture. The shoulder is a ball-and-socket joint that allows the arms to be raised, twisted, bent, and moved forward, to the side and backward. The head of the upper arm bone (humerus) is the ball, and a circular cavity (glenoid) in the shoulder blade (scapula) is the socket. A soft-tissue rim (labrum) surrounds and deepens the socket. The head of the humer is also covered with a smooth, tough tissue (articular cartilage); and the joint, also called the acromioclavicular (AC) joint, has a thin inner lining (synovium) that facilitates movement while surrounding muscles and tendons provide stability and support. What are the common Orthopedic problems? The best orthopedic hospitals in India provide supreme quality patient care, engage in education and research thoroughly. The hospitals have latest equipment and advanced facilities, the expert doctors and surgeons that offer comprehensive treatment and care for each patients. The top orthopedic hospitals in India are located at Mumbai, Delhi, Gurgaon, Noida, Hyderabad, Bangalore, Chennai, Ahmedabad, Nagpur, etc. The Top surgeons in India treats the osteoarthritis related ailments thoroughly and ensure the patient satisfaction and happiness. A patient is usually referred to an orthopedic surgeon by a primary care physician, emergency room physician, or other doctor. Prior to any surgery, candidates undergo extensive testing to determine appropriate corrective procedures. Tests may include x rays, computed tomography (CT) scans, magnetic resonance imaging (MRI), myelograms, diagnostic arthroplasty, and blood tests. The orthopedist will determine the history of the disorder and any treatments that were previously tried. A period of rest to the injured part may be recommended before surgery is undertaken. Surgical candidates undergo standard blood and urine tests before surgery and, for major procedures, may be given an electrocardiogram or other diagnostic tests prior to the operation. 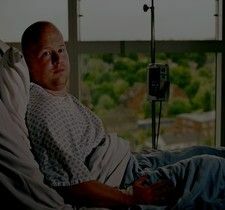 Individuals may choose to donate some of their own blood to be held in reserve for their use in major surgery such as knee replacement , during which heavy bleeding is common. What are the preparations after the Surgery? As with any surgery, there is always a risk of excessive bleeding, infection, and allergic reaction to anesthesia. Risks specifically associated with orthopedic surgery include inflammation at the site where foreign materials (pins, prostheses, or wires) are introduced into the body, infection as the result of surgery, and damage to nerves or to the spinal cord. Thousands of people have successful orthopedic surgery each year to recover from injuries or to restore lost function. The degree of success in individual recoveries depends on an individual's age and general health, the medical problem being treated, and a person's willingness to comply with rehabilitative therapy after the surgery. Abnormal results from orthopedic surgery include persistent pain, swelling, redness, drainage or bleeding in the surgical area, surgical wound infection resulting in slow healing, and incomplete restoration of pre-surgical function. What are the advance Orthopedic Surgeries? Torn labrum repair surgery: The procedure for torn labrum repair surgery is very complex and it requires experienced surgeons to perform such kind of surgery. The labrum is a type of cartilage found in the shoulder joint. The shoulder is a ball and socket joint where the arm meets the body. Tears of the labrum near the biceps tendon attachment (SLAP lesions) may be just trimmed or may need to be reattached to the top of the socket. The best way to do this is with arthroscopic surgery since this area is difficult to reach with an open operation through a large incision. Using the arthroscope and small incisions for other instruments, the labrum can be re-attached to the rim of the socket using either sutures or tacks. Generally patients get recovered very fast and they are discharged the same day. Is designed to ensure continued functionality of the foot and ankle areas. Patients, who complain of joint and ligament problems, as well as those with congenital deformities, are offered a plethora of surgical solutions that fix bones, muscles, and joints. Certain podiatric surgeons specialize in minimally invasive surgery, while others perform full reconstructions. Why prefer Orthopedic Surgery in India? Of late, India has become a favorable destination for various orthopedic surgeries. The reason behind this paradigm shift is because of its infrastructure and technology which is virtually equivalent to those in USA, UK and Europe. India has some of the best hospitals and treatment centers in the world and some truly superior facilities, with almost zero patients wait list. The medical centers and orthopedic hospitals in India have state of the art facilities, equipped with state of art infrastructure and latest technology. Hospitals adhere to international standards of clinical care, safe environment, medication safety, respect for rights and privacy, international infection control standards. The panel of Indian orthopedic surgeons are highly qualified, having the experience of thousands of Joint replacement surgeries - both primary and revision surgeries of the hip, knee, shoulder as well as Uni-Compartmental Knee replacement. They are trained and worked in some of the best centers in England, USA & Europe. They have a good success rate and are world renowned medical professionals known to cater service both India and abroad. Orthopedic Surgery in India is available at various hospitals in the following cities with latest amenities and state-of-art-facilities. We have PAN-India level tie ups with TOP Hospitals for Orthopedic Surgery across 15+ major cities in India. We can provide you with multiple top hospitals & best surgeons recommendations for Orthopedic Surgery in India. The orthopedic surgery offered at Tour2India4Health was professional and quite impressive. 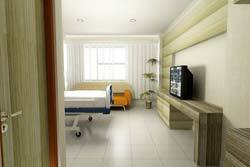 The surgeon was at his best and the hospital was clean with a warm ambience and lively nursing staff. In addition, the transfer services from hotel, airport and hospital were well organized. India is the most preferable destination for patients who are looking for low cost Orthopedic surgery. The cost of the Orthopedic Surgery in India is typically a fraction of the cost for the same procedure and care in the US and other developed countries. Comparing Orthopedic Surgery cost in India with the same treatment procedure in other countries, the price for surgery would be 30-50% lower. The cost can vary depending on the type of surgery required and other medical conditions of a patient. The costs of the Orthopedic Surgery based on the type of the surgery required in various countries in the chart / table are given below. The price comparison is given in USD. *The price for the Orthopedic Surgery is an average collected from the 15 best corporate hospitals and 10 Top Orthopedic surgeons of India. How to get Low Cost Orthopedic Surgery in India? We have worked out special packages of the Orthopedic Surgery for our Indian and International patients. You can send us your medical reports to avail the benefits of these special packages. You would be provided with 3 TOP RECOMMENDED SURGEONS / HOSPITALS FOR YOUR ORTHOPEDIC SURGERY in India. How many International patients came to India for Orthopedic Surgery? 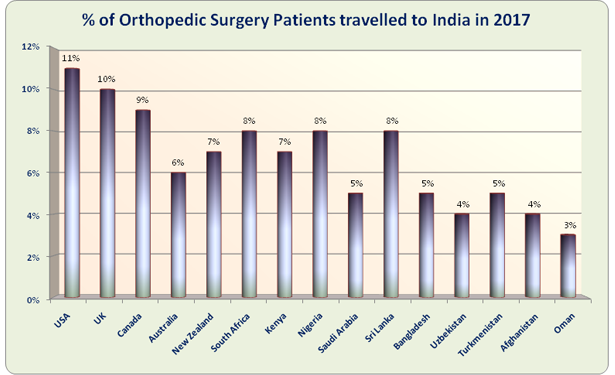 The list of TOP 15 countries from where the Orthopedic Surgery Patients travelling to India are given below. The major reason of large number of patients travelling to India for medical treatment from these countries is because of availability of top orthopedic surgeons, quality healthcare in India, affordable prices and very good air connectivity, tourism options and many more reasons. The maximum number of patients for Orthopedic Surgery come from - USA, UK, Canada, Australia, New Zealand, South Africa, Kenya, Nigeria, Saudi Arabia, Sri Lanka, Bangladesh, Uzbekistan, Turkmenistan, Afghanistan, Oman. ARE YOU ALSO A PATIENT WANTING TO TRAVEL TO INDIA FOR ORTHOPEDIC SURGERY? Our International Patient Executive would connect with you and answer all that you need to plan your Orthopedic Surgery in India. Will someone guide me on the duration and cost of treatments for my Orthopedic Surgery in India? Duration and cost of Orthopedic Surgery in India may depend upon several factors like the kind of treatment or the consulting medical team. Our company representatives will assist you in finding the duration and rates. What is the average cost of Orthopedic Surgery India? The costs involved in Orthopedic Surgery in Best Hospitals in India vary as per treatment required. You can visit our website to know the rates involved, or send us a query. Are hip and knee replacement surgeries only done on people 65 and older? No, hip and knee replacement surgeries can be done on people with problems at birth, through injury, or as the result of aging. The patient need not be 65 years of age or older. Are there any materials about this surgery that I can review? We have a large number of medical tourism articles for your perusal. You can go through testimonials, videos of international patients, links of which are available on our website, to help you in decision-making. Keep your medical reports ready, bring all medications you may be taking prior to surgery. Your attending doctors will update you before hand on what you must carry ahead of the Surgery in India.